And now with added tudor roses (footnote to new headers post). The “Lancastrian” red rose was an emblem that barely existed before Henry VII. Lancastrian kings used the rose sporadically, but when they did it was often gold rather than red; Henry VI, the king who presided over the country’s descent into civil war, preferred his badge of the antelope. Contemporaries certainly did not refer to the traumatic civil conflict of the 15th century as the “Wars of the Roses”. For the best part of a quarter-century, from 1461 to 1485, there was only one royal rose, and it was white: the badge of Edward IV. The roses were actually created after the war by Henry VII. 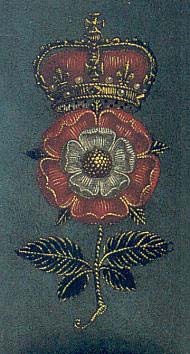 On his marriage, Henry VII adopted the Tudor rose badge conjoining the white rose of York and the red rose of Lancaster. The Tudor rose is occasionally seen divided in quarters (heraldically as “quartered”) and vertically (in heraldic terms per pale) red and white. More often, the Tudor rose is depicted as a double rose, white on red and is always described, heraldically, as “proper”.” – Wikipedia. I think the official tudor rose may just have two sets of petals, and certainly doesn’t have the prickles, or sepals appearing other than on the outer rim. OK yah, tudor rose has just five petals round, that’s ten in all, not six and eighteen, but I was doing this from memory, and ended up with my take on it. Argh! Those concave gouge cuts look convex again! My eye messes my brain up again. Didn’t like some of this, best at three o’clock. Rather puzzled why I could use the radius to mark out sixths on the circle perimeter, just about. Thought it would be much less accurate than that. PS The reason for the plural ‘headers’ will become clear in a couple of weeks when I start forging nails. Incidentally, I used to reckon to be pure bred Yorkshire, but it turns out the Law part of my ancestry goes back quite a damn long way – in Lancashire!